Our unique collection of 19th century booking binding equipment is the cornerstone of our permanent exhibit. Preview some of these rare objects now. Please contact collections@bookbindersmuseum.org for more information. 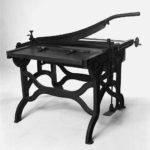 Called arming presses or blocking presses in England and embossing machines or stamping presses in America, these machines used heating irons to heat up a chase, and then a lever arrangement would bring it down and impress a design, often in gold, on to the book cover or spine. This is the oldest machine in our collection. An illustration of a Imperial Arming Press of a different design appears in Arnett’s Bibliopegia 1835. American, W. O. Hickok and Sons, 20th century. 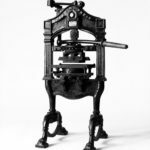 Before mechanization, the lying press was the binder’s all-purpose mainstay piece of equipment, used for backing books, pressing textblocks, gilding edges, and, with its accessory the plough, for trimming the edges of books, cutting coverboard, and cutting reams of paper to size. The design was developed sometime in the fifteenth century, was refined in the eighteenth century, and has remained largely unchanged (and in occasional use) to the present day. W. O. Hickok and Sons. Described in our Gane Brothers catalogue as a Gauge Table Shears, style “C” example shows an improved foot pedal design over the style “B” illustrated in the 1869 Hickok catalogue. 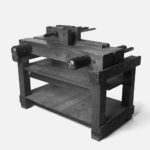 As casebinding became the norm bookbinders needed a tool to cut coverboard fast, square and consistent.